Seventeen ATTA members and their invitees met at Pistolera in Shanghai on May 14 to discuss what lies ahead in the coming years for agents of Transformation & Turnaround, such as ourselves, in China. This lively discussion session over Mexican buffet and frozen Margaritas was the first of a two-part discussion, focusing on new trends being observed in China. The discussions were facilitated by Yifei Zhang, Account Manager, Control Risks and ATTA Director Steve Hardacre, Managing Director, Game Changing Healthcare. -Is ongoing and continuous company restructuring the "new norm" in China? -Will we continue to see double-digit compensation and benefits annual growth for employees and staff despite the economic slowdown in China, and is that really sustainable? -Will there continuously be tense labor relationships with associated more frequent breakout violence throughout China as was seen in 2014? 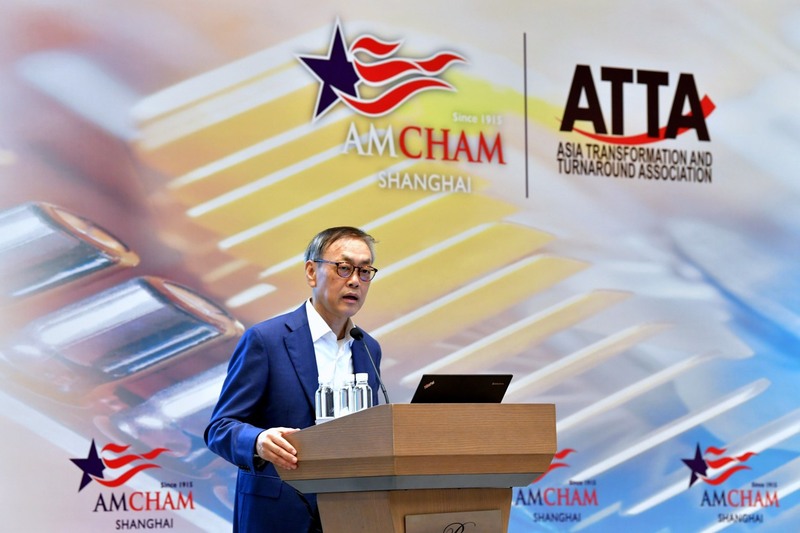 We will continue the discussion highlighted above at our June session, with an added new discussion about what we as members of ATTA can and should do about the current and coming period of greater unpredictability in China. On 20 May, 2014, members and friends of the ATTA Shanghai Chapter gathered at the offices of Simmons & Simmons in Shanghai to hear Steve Hardacre, Managing Director, and Jeff Powell, Senior Consultant, of Game Changing Healthcare present on "Healthcare Compliance: Moving from Crisis to Game Changing". The presentation provided some highly thought-provoking ideas on the development of the healthcare compliance sector which generated a lively discussion session. We are grateful for the ongoing support of Simmons & Simmons. A Networking Breakfast was held at the offices of Simmons & Simmons on 27th March 2014 where the Shanghai Chapter welcomed Dr Frank Nikolaus. Dr Nikolaus is founder and honorary president of the German Chapter of the Turnaround Management Association. He shared his views on the state of the transformation and turnaround market in Germany and Europe. Shanghai - "Transformation and Turnaround - a view from the current trenches"
On 27th February 2014, the Shanghai Chapter hosted a networking breakfast at the offices of EIM China - NewBridge Partners. Aloysius Tan gave a highly informative and thought-provoking talk on "Transformation and Turnaround - a view from the current trenches". The Shanghai Chapter hosted a pre-holiday get together on 11th December 2013. ATTA member TT Chen hosted the event and gave a fascinating presentation on his turnaround experience. On 11th September 2013, Newbridge Partners hosted a Networking Breakfast. Francesco Masetti-Placci of Newbridge Partners talked about "R&D in China: Transformation and Recent Trends". Following the presentation, a discussion was held on the expectations for ATTA in the next 12 months. This produced some excellent ideas which are now being considered and implemented. On 21 May 2013, a Networking Breakfast was held at the offices of Pinsent Masons and Joe Fan, Senior Director, Corporate Finance / Restructuring and Marcus Paciocco of FTI Consulting, Shanghai talked about their work in turnarounds in China over the past decade. On 19 March 2013, a discussion was held on lessons learned from the Caterpillar write-off following a fraudulent M&A transaction in China. Steve Hardacre, Partner, GCP Asia Ltd led the discussion and was joined by ATTA Shanghai Chapter Heads Lesli Ligorner, Partner, Simmons & Simmons and Bernd Stucken, Partner, Pinsent Masons.